Using INASTAMOR pressure-conductive rubber as the sensing material, we developed a flexible tactile sensor array to measure three-axis contact force and slip. The sensor array has 9 (3 × 3) sensing units, each consisting of three layers, i.e., a bottom electrode, conductive rubber chips, a top polydimethylsiloxane (PDMS) bump. We detailed the array’s structural design, working principle, and fabrication process. 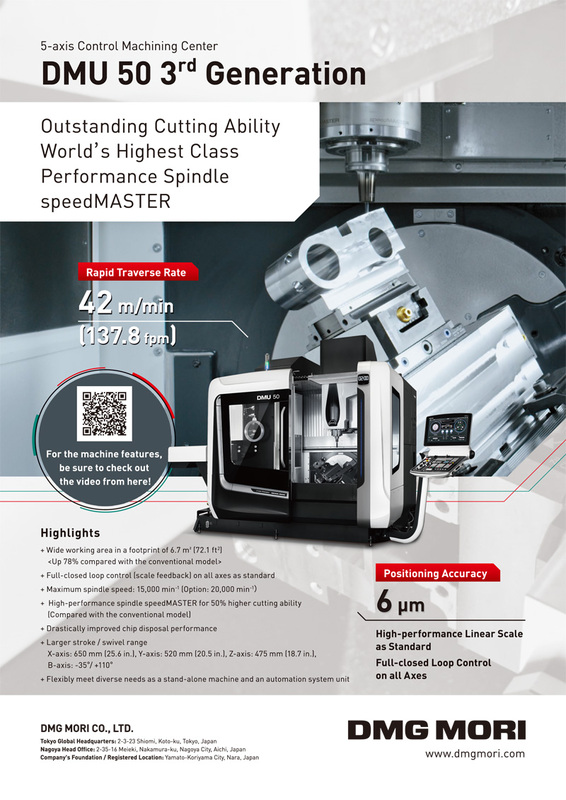 We also characterize the array’s three-axis force measurement performance. The full-scale force measurement ranges and sensitivities in x-, y-, and z-axes are characterized as 5, 5, 20 N and 0.675, 0.677, 0.251 V/N, respectively. The array is mounted on a prosthetic hand for detecting contact force and slip occurrence in grasping. Results showed that the array measures three-axis contact force and detects slippage by using discrete wavelet transformation. The tactile sensor array has potential applications in robot-hand grasping that require simultaneous slip detection and three-axis contact force measurement. Y. Wang, K. Xi, D. Mei, G. Liang, and Z. Chen, “A Flexible Tactile Sensor Array Based on Pressure Conductive Rubber for Contact Force Measurement and Slip Detection,” J. Robot. Mechatron., Vol.28, No.3, pp. 378-385, 2016. V. Ho, M. Makikawa, and S. Hirai, “Flexible Fabric Sensor Toward a Humanoid Robot’s Skin: Fabrication, Characterization, and Perceptions,” IEEE Sensors J., Vol.13, pp. 4065-4080, 2013. H. Lee, S, Chang, and E. Yoon, “A Flexible Polymer Tactile Sensor: Fabrication and Modular Expandability for Large Area Deployment,” J. Microelectromech. Syst., Vol.15, No.6, pp. 1681-1686, 2006. 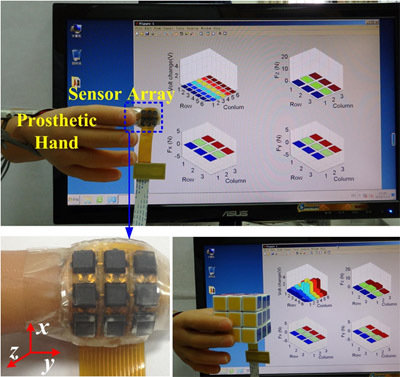 Y. Wang, K. Xi, G. Liang, D. Mei, and Z. Chen, “A Flexible Capacitive Tactile Sensor Array for Prosthetic Hand Real-Time Contact Force Measurement,” Proc. IEEE Int. Conf. on Information and Automation, pp. 937-942, 2014. K. Kim, K. R. Lee, W. H. Kim, K. B. Park et al., “Polymer-based flexible tactile sensor up to 32×32 arrays integrated with interconnection terminals,” Sensors and Actuators A: Physical, Vol.156, pp. 284-291, 2009. R. S. Dahiya, G. Metta, M. Valle, and G. Sandini, “Tactile sensing – from humans to humanoids,” IEEE Trans. on Robotics, Vol.26, pp. 1-20, 2010. K. Noda, K. Hoshino, K. Matsumoto, and I. Shimoyama, “A shear stress sensor for tactile sensing with the piezoresistive cantilever standing in elastic material,” Sensors and Actuators A: Physical, Vol.137, pp. 295-301, 2006. M. A. Qasaimeh, S. Sokhanvar, J. Dargahi, and M. Kahrizi, “PVDF-based microfabricated tactile sensor for minimally invasive surgery,” J. Microelectromech. Syst., Vol.18, No.1, pp. 195-207, 2009. G. Liang, Y. Wang, D. Mei, K. Xi, and Z. Chen, “A modified analytical model to study the sensing performance of a flexible capacitive tactile sensor array,” J. Micromech. Microeng., Vol.25, pp. 035017-14, 2015. H. K. Lee, J. Chung, S. Chang, and E. Yoon, “Real-time measurement of the three-axis contact force distribution using a flexible capacitive polymer tactile sensor,” J. Micromech. Microeng., Vol.21, pp. 1-9, 2011. R. Ahmadi, M. Packirisamy, J. Dargahi, and R. Cecere, “Discretely loaded beam-type optical fiber tactile sensor for tissue manipulation and palpation in minimally invasive robotic surgery,” IEEE Sensors J., Vol.13, No.1, pp. 22-32, 2013. T. Liu, Y. Inoue, and K. Shibata, “A small and low-cost 3-D tactile sensor for a wearable force plate,” IEEE Sensors J., Vol.9, No.9, pp.1103-1110, 2009. T. Zhang, H. Liu, L. Jiang, S. W. Fan, and J. Yang, “Development of a flexible 3D tactile sensor system for anthropomorphic artificial hand,” IEEE Sensors J., Vol.13, pp. 510-518, 2013. T. Zhang, L. Jiang, X. Wu, W. Feng, D. Zhou, and H. Liu, “Fingertip Three-Axis Tactile Sensor for Multifingered Grasping,” IEEE/ASME Trans. on Mechatronics, Vol.20, No.4, pp. 1875-1885, 2015. C. Chuang, Y. Liou, and C. Chen, “Detection system of incident slippage and friction coefficient based on a flexible tactile sensor with structural electrodes,” Sensors and Actuators A: physical, Vol.188, pp. 48-55, 2012. S. Teshigawara, K. Tadakuma, M. Aiguo, M. Ishikawa, and M. Shimojo, “High Speed and High Sensitivity Slip Sensor Utilizing Characteristics of Conductive Rubber,” J. of Robotics and Mechatronics, Vol.21, No.2, pp. 200-208, 2009. Y. Suzuki, S. Teshigawara, M. Chiba, T. Shimada, A. Ming, and M. Shimojo, “Experimental Discussion of Occurrence of High-Frequency Component on Slip Sensor Output Using Pressure Conductive Rubber,” J. of Robotics and Mechatronics, Vol.25, No.2, pp. 316-323, 2013. S. Teshigawara, T. Tsutsumi, S. Shimizu, Y. Suzuki, and A. Ming, “Highly Sensitive Sensor for Detection of Initial Slip and Its Application in a Multi-fingered Robot Hand,” Proc. IEEE, Int. Conf. on Robotics and Automation, pp. 1097-1102, 2011. K. L. Xi, Y. C. Wang, D. Q. Mei, G. H. Liang, and Z. C. Chen, “A Flexible Tactile Sensor Array based on Pressure Conductive Rubber for Three-Axis Force and Slip Detection,” Proc. IEEE, Int. Conf. on Advanced Intelligent Mechatronics (AIM), pp. 476-481.